The war in Syria has killed over 220,000 people, uprooted millions of families, all but destroyed the health & education systems, and left ancient cities like Aleppo in ruins. Syria's war has killed more than 220,000 people, uprooted half the population and left the country in ruins since erupting four years ago. The descent into war began with the violent and brutal repression of peaceful pro-reform protests, which later turned into an armed uprising against the regime of Bashar al-Assad, and has since become a regional conflict invloving state and non state actors. We take a look back at how events unfolded in Syria over the past four years. 15 March 2011: Dubbed the "day of rage" by activists, hundreds staged protests in Damascus and Aleppo, calling for democratic reforms, demanding for greater civil liberties and freedom for political prisoners after 40 years of brutal rule by the Assad family. 18 March 2011: Security forces open fire on a protest in Daraa, killing four people in what activists say was the first deaths of the uprising. Demonstrations spread, as does the crackdown by Assad's forces. April 2011: Security forces raid a sit-in in Syria's third-largest city, Homs, where thousands of people tried to create the mood of Cairo's Tahrir Square, the epicentre of protests against Egypt's autocrat Hosni Mubarak. June 2011: Police and soldiers in Jisr al-Shughour in northeastern Syria join protesters they were ordered to shoot, and the uprising claims control of a town for the first time. Elite government troops, tanks and helicopters retake the town within days. August 2011: President Barack Obama calls on Assad to resign and orders Syrian government assets frozen. July 2012: A bombing at the Syrian national security building in Damascus during a high-level government crisis meeting kills four top officials, including Assad's brother-in-law and the defence minister. Summer 2012: Fighting spreads to Aleppo, Syria's largest city and its former commercial capital. Over time, rebels seize control of about half of the city, but the battle there rages to this day, leaving much of Aleppo in ruins. August 2012: Kofi Annan quits as UN-Arab League envoy after his attempts to broker a cease-fire failed. Obama says the use of chemical weapons in Syria would be a "red line" that would change his thinking about military action. November 2012: The Syrian National Coalition is created, bringing together the main opposition factions. The umbrella group is hampered from the outset by infighting and accusations that its members are out-of-touch exiles. March 2013: That month, the number of UN-registered Syrian refugees tops 1 million, half of them children. June 5: The Syrian army recaptures the key border town of Qusayr, in an assault led by fighters from Lebanon's Hezbollah. 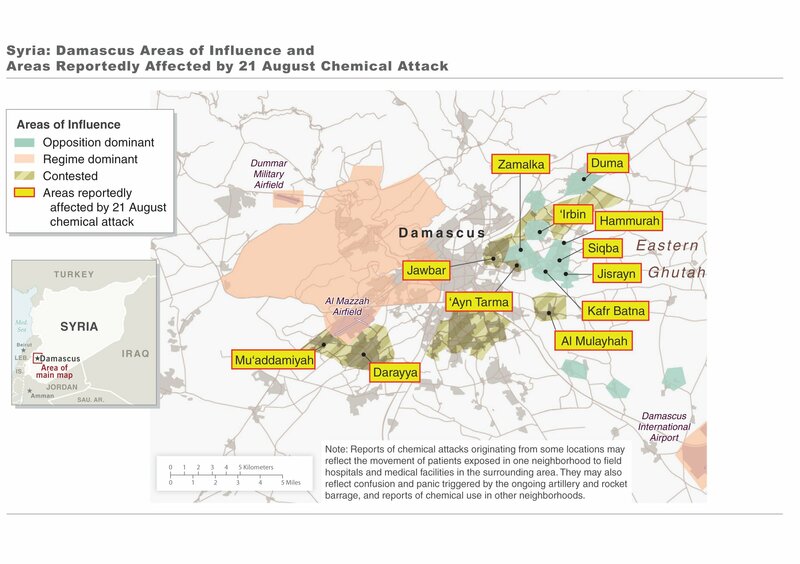 August 21: the regime is accused of killing more than 1,400 people, according to the United States, with chemical weapons in two rebel-held zones near Damascus. September 2013: Around a dozen rebel groups abandon the Syrian National Coalition and reject its calls for a civil, democratic government. Seven of them later form their own alliance, the Islamic Front, intended to eventually create a state governed by Islamic law. October 2013: Syria destroys its chemical weapons production equipment. The number of Syrian refugees registered with the UN tops 2 million. January 2014: Infighting among rebels spreads, pitting a variety of Islamists groups and moderate factions against the al-Qaida-breakaway calling itself Islamic State of Iraq and the Levant. February 2014: Two rounds of peace talks led by UN-Arab League mediator Lakhdar Brahimi in Geneva end without a breakthrough. 09 May 2014: Rebels withdraw from the old quarter of the central city of Homs in a significant symbolic victory for the government, putting the area that had been under siege for more than a year firmly in government hands. 13 May 2014: Brahimi resigns as UN-Arab League envoy to Syria, marking a second failure by the United Nations and Arab League to end the civil war. 3 June 2014: Syrians in government areas vote in presidential elections. Assad, one of three candidates, overwhelmingly wins with 88.7 percent. June 2014: So called Islamic State group, as the Islamic State of Iraq and the Levant is now known, seizes large parts of northern and western Iraq. In control of around a third of Syria and Iraq, it declares a self-styled Islamic caliphate. 3 July 2014: Islamic State group takes control of Syria's largest oil field, al-Omar, after fierce battles with the Nusra Front, al-Qaida's branch in Syria. 10 July 2014: Italian-Swedish diplomat Staffan de Mistura is named new UN envoy to Syria. 19 August 2014: Islamic State militants release video of the beheading of American journalist James Foley, the first of five Westerners to be beheaded by the IS group. 24 August 2014: Islamic State fighters capture Tabqa military air base in northeastern Syria, eliminating the last government-held outpost in Raqqa province. 23 September 2014: US-led coalition begins airstrikes against Islamic State group targets in Syria. Mid-September 2014: IS begins offensive to take Syrian Kurdish town of Kobani, on the Turkish border. January 2015: UN estimates Syria's conflict has killed at least 220,000 people and uprooted nearly a third of the prewar population of 23 million from their homes. 26 January 2015: With the help of US-led airstrikes, Kurdish fighters take control of Kobani. 3 February 2015: IS releases a video of captured Jordanian pilot Muath al-Kaseasbeh being burned to death in a cage, sparking outrage in Jordan, which launches new strikes targeting the militants. 6 February 2015: IS claims a Jordanian airstrike kills American hostage Kayla Jean Mueller. US officials later confirm her death, but say it wasn't caused by a Jordanian airstrike. 25-28 February 2015: IS overruns several Christian villages in Syria's eastern Hassakeh province, taking at least 220 Assyrian Christians hostage. The UN and over 130 rights and humanitarian groups have castigated world powers for failing to protect Syrians, as a number of reports marking the war's fourth anniversary illustrate how the lights have gone out in Syria. Syrian government forces are responsible for killing nearly 600 doctors and medical workers during the four-year war, Physicians for Human Rights said on Wednesday, calling the attacks a crime against humanity.